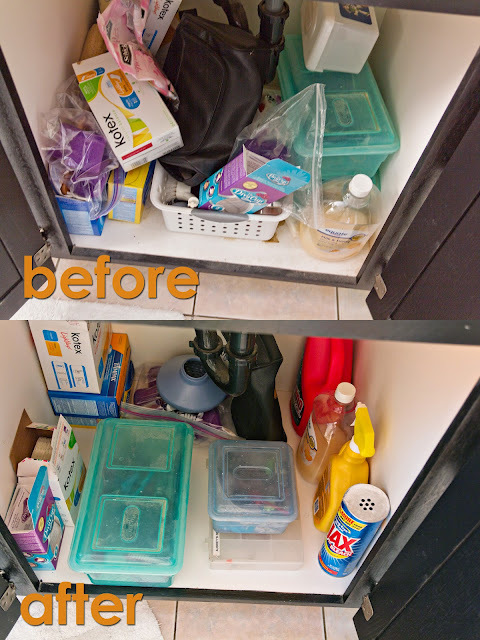 This is Part 2 of my How I Organized My Entire House for $0.00 (Really!) series. Part 1 (Intro) is here. I want to start off this series by giving myself a set of rules (more like guidelines) to follow. It's easy to get carried away and easy to lose sight of your goals, so this will help keep me on-track. Think about how you live your life. It doesn't make sense to have a system that doesn't work with how you live. Have the things you use together grouped together, not always like with like*. You usually use tape and scissors and wrapping paper together. Have them together. You usually use toothpaste and toothbrushes together (if I'm making any weird assumptions here, feel free to educate me! :) )--make it so you only open one drawer or one cabinet to get them. Think efficiency. Have the things you use the most in easiest reach. The stuff you use less can be harder to get to. Make things easier on yourself. Along with number 2, have the things where you use them, or put them where you are more likely to use them. ** Don't get too caught up in where things are "supposed" to go. Put them where they work for you. Make things easy to put away. If they aren't (and you are like me), they won't get put away. Reevaluate. Organize, then go back a week later and see if it's working. If not, tweak. Just because you organized it one way doesn't mean it has to stay that way. And it's easier to rework it when it's still somewhat organized than when it's completely disorganized because the system didn't work with the way you live. Get rid of stuff you don't use. I've heard if you haven't used it in the last year, get rid of it. But, I think that's unrealistic. I have things I haven't used in the last year that I want to keep and it would tick me off to replace. But, there is a lot of good in honestly evaluating if you are going to use it. Are you holding onto something because of guilt? Because of what it represents? **** When getting rid of stuff, the biggest thing is to be honest with yourself. Educate your family on your new system, but don't overwhelm them. Make it fun. Get their input if it affects them (I've found it works a lot better if ideas come from everyone, instead of my trying to impose a top down approach). It doesn't have to be perfect. It won't be perfect. What you organize now will probably have to be organized again at some point. Hopefully a long, long time from now. But, your life will change. Your needs will change. Don't get caught up in perfectionism or get overwhelmed. One little piece at a time. **I have a topical acne medication I need to use every day, but not within 30 minutes before or after showering. When it was in the bathroom, I didn't use it regularly. But, put it by my laptop, and suddenly I remembered to use it twice a day like I am supposed to. ***It's my experience that I will put something box in a drawer, but not necessarily a certain spot in that box in drawer. For example, if I have a box for often-used medicines: works great! If I have a certain spot for Tylenol in the box, it doesn't get put there every time by everyone and I get frustrated. It doesn't work across everything (forks have a certain spot, dang it! ), but it's a generally good rule of thumb. ****Sometimes that's ok--you may pry my great-grandma's quilts out of my bloody fingers--but sometimes it means you need to let go of that to get rid of it. I kept some kitchen gadgets for a long time, because if I had kitchen gadgets, then surely it meant that someday I was going to be fabulous and motivated to cook all the time, right? And, it would make life easy, and I would transform into super chef-type "good mom" person. I was invested in seeing myself as "person with cool kitchen gadgets" and invested in thinking that a good mom cooks every night. Once I let go of that--good moms don't have to cook every night--then I could get rid of the clutter that wasn't helping my life. Or my cooking. Do you all have any other tips? I'd love to hear what has and hasn't worked for you! The main problem with our master bath is that the cabinet storage wasn't being used well. The drawers were working ok, the floating shelves I barely tweaked at all, but behind those under-the-sink doors, that stuff was always trying to escape. I pretty much tossed a bunch of crap in there when we moved in and never looked at it again. Another big thing was getting rid of stuff in here we don't use. I had old products that were around since Griffin was a baby (six or seven years ago!) or even before that I've barely used. A large part of what was holding me back was being realistic about the products I use. 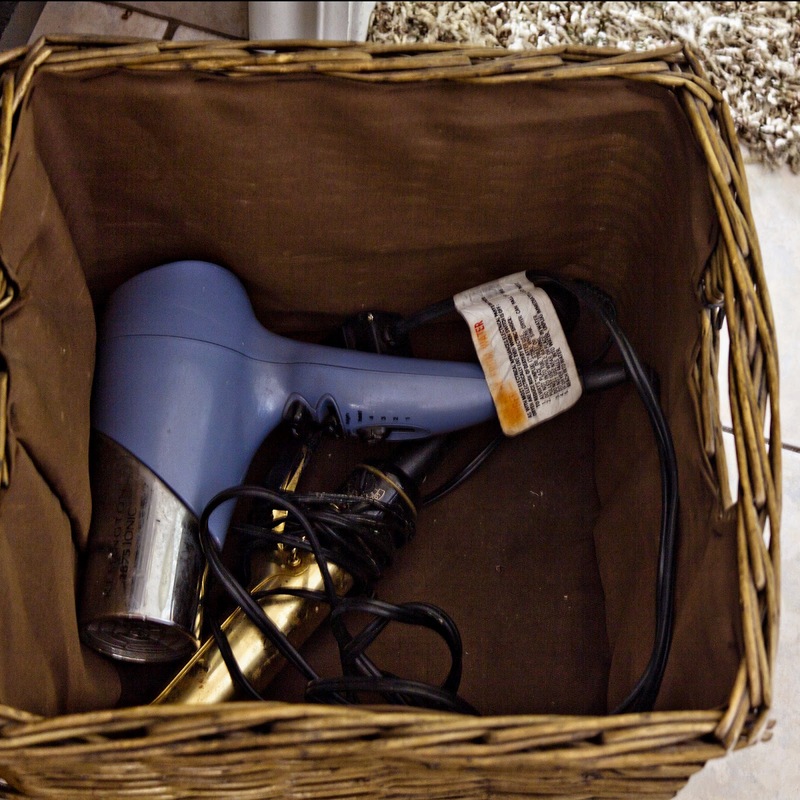 I got rid of a flat iron, a curling iron, four brushes, six or seven or eight bottles of stuff I never use and a whole trash can of stuff. I also removed some things we never use in the bathroom, like some first aid kit stuff. Why is it in here if we don't use it in here? Because it got tossed in here when we moved in. I also rearranged some things, and tweaked positions of stuff. Like most of the brushes went under the sink in a bin, except for the two we use most. This just looks like a messy bathroom. Yeah, pretty much. But, it looks nice and neat afterward. I was able to make the floating shelves a lot neater and all the cleaning supplies are under the sink now. This is just a quick aside to show you where I keep all my corded hair things (better name for hair dryer, curling iron, flat iron? Not coming to me). 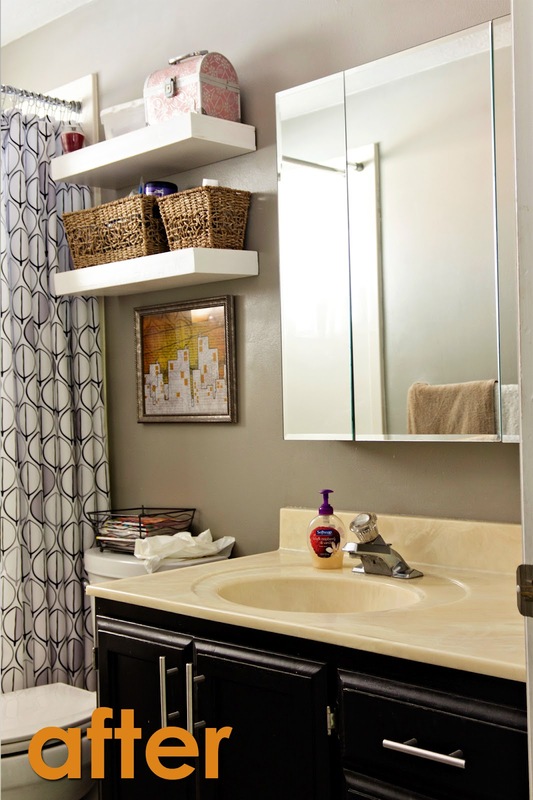 Scroll down to the photo below to see where this basket sits, under the two drawers in the vanity. 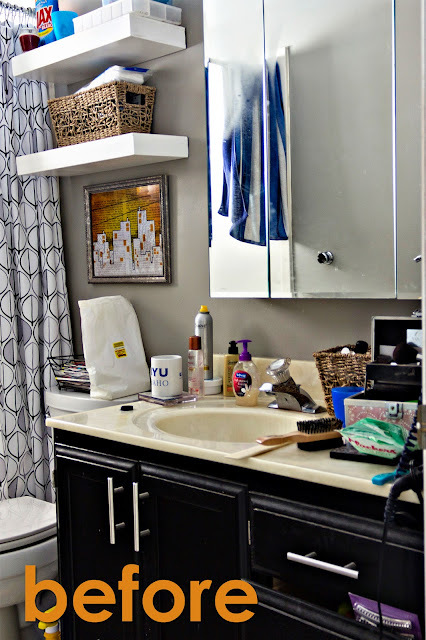 I added this back when I painted the vanity, and it's been soooo great for these types of things. No winding cords. I just throw the things in there, and call it good, and since there are only three, the cords don't tangle. This is the top drawer of the vanity. It was a drawer of whatever landed in here, but mostly David's shaving stuff (the dude is hairy). So, I decided to make it official, and just put shaving things in here. It's a shallow drawer, so not a lot fits in here. The great thing about this is that after he's done with something, it can just get tossed back into the drawer. 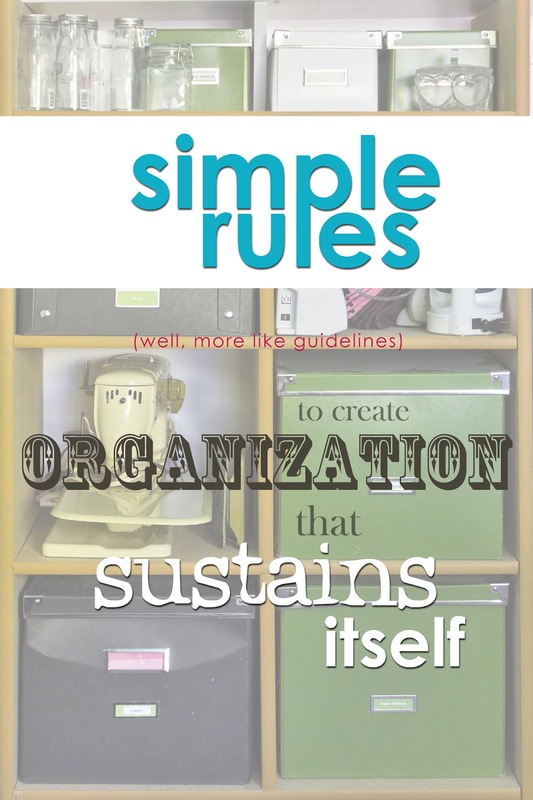 (See numbers four and five of the rules--simplicity. This is a system we can keep up.) My razors suddenly had a place to be, which was sweet after roaming all over the bathroom. 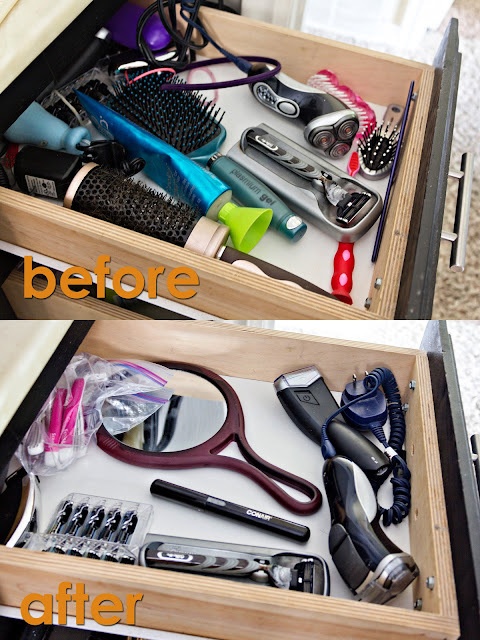 It's so much easier to see what is in the drawer now! This is the second drawer down, where our hair stuff lives. With my short hair, my hair needs are fairly minimal most of the time. This is mostly Aubrey's stuff. I normally do her hair, but she brings me the things I need. Our new ritual is that I do her hair on the bed before she goes to school, so she's been fetching me the comb and hair bands and bobby pins. Now she can just take the plastic tray (the plastic hair bands she uses are in the plastic tray next to the bobby pins) and the brush and bring it to me and we will be ready to go. Everything else that was in here got put in a different spot (under the sink). Everything is easy to see and easy to find. The dreaded under the sink. This photo does not accurately portray the horribleness. I was able to completely get rid of that white basket and one of the teal plastic containers (sweeeeet! empty containers for another area of the house!). All the cleaning stuff is along the right side. Less used hair stuff at the back--I only use that stuff for special occasions (read: theater). The teal container has the rest of the brushes, the light blue one has all the fancy bows, the clear plastic one underneath it has Aubrey's bracelets (she was so excited to be able to reach this stuff, as it had been up on the floating shelves). Then feminine hygiene to the left. I remembered I hadn't included room for toilet paper after I took this picture, so I slid the bows on top of the brushes and moved everything over, and it fit no problem! Things aren't trying to escape anymore. Again, easy to see, easy to find. It doesn't seem that impressive in photos, but it is in person. It only took me about an hour and half to sort everything and find it new homes (I also rearranged hair products and some of my make up), but it makes a huge difference on how easy it is to find things. I didn't do too much in the medicine cabinet because the toothbrushes and hairspray and cologne situation in there was working pretty well already. I told David I organized the bathroom, and he was all like: crap, am I going to be able to find anything? He was relieved to see that everything of his basically stayed the same, except easier to see, find and put away. That's the goal! Mission accomplished in the master bath. Sooooo, time to dream! If I had some money, what would I upgrade? I would buy a pretty soap dispenser. 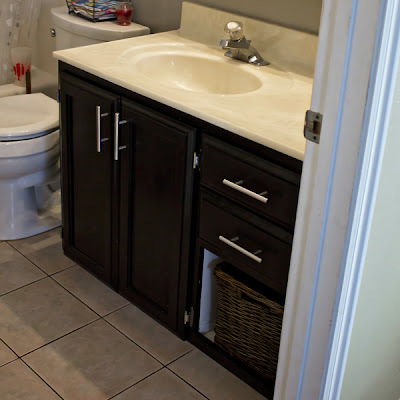 I would get a shelf for underneath the sink (actually, I could build one out of materials I already have, so I may do that as one of my future projects). Another couple of baskets for the floating shelves. The ones I have came from Walmart, fyi. New towels. We have matching ones, but I love fresh towels! A pretty scented yellow candle! Prettier containers. I love pretty containers. The plastic ones are good for the bathroom though, and they stack well. Use dryer sheets to clean your bathroom--I use this tip; it is awesome! Coat hook in shower (hang on opposite side of shower head to hang caddy on)--I have built in shelves in my shower, but this is such a great idea! Thanks Kara for this fab article!! Makes me feel a little better about being disorganized(my before pictures would look far far worse than yours!!) I try every now and then to clean up...feel so proud...and, within a few months we are back to square one!! I have only 2 kids...probably older than yours, I live in India and have domestic help...so I really have no excuse!! Good luck in your organisational ventures and thanks so much for sharing! Great job! I love organizing so I appreciate all the hard work you put into this. I just spend 4 hours yesterday going through all the toys in the basement and organizing the craft/toy closet. It looks so much better and I feel better, too. BTW, I put my feminine hygiene items in a basket under the sink that I can move to beside the toilet when necessary then move back at the end of the week. It's cleaned up the area around the toilet and is one simple movement instead of juggling a bunch of boxes. It works for me! Wow reading this literally sounds just like I wrote it. Finally an organizing article that fits me! I've been inspired and am currently gutting my master bath and staring over. THANK YOU! Thanks for the inspiration. I am TRYING to get my house organized, it is overwhelming to say the least. Your insight is very helpful. 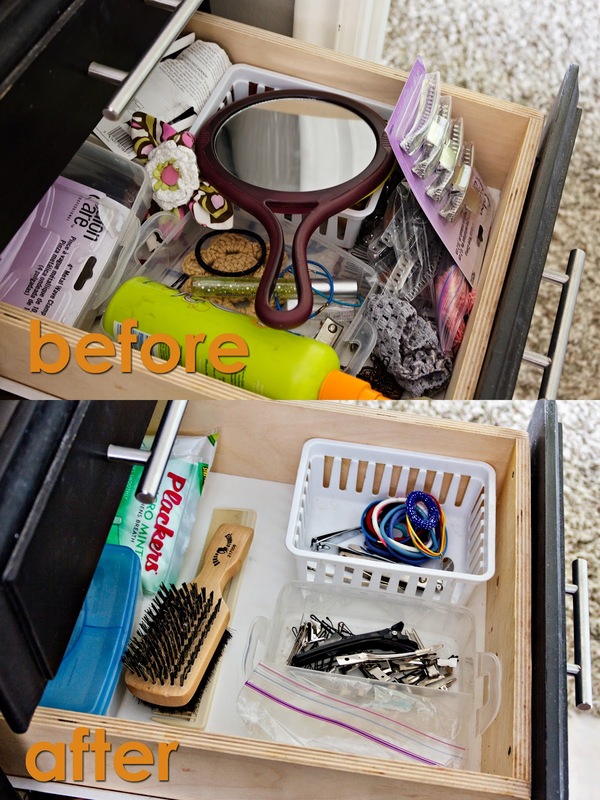 I found attaching narrow baskets to the inside of most cabinet doors is great for everyday use items. Hooks are also very beneficial. Thanks again.